Old pilings of ancient docks sit next to new docks, where kayakers and other other water sport enthusiasts launch from. 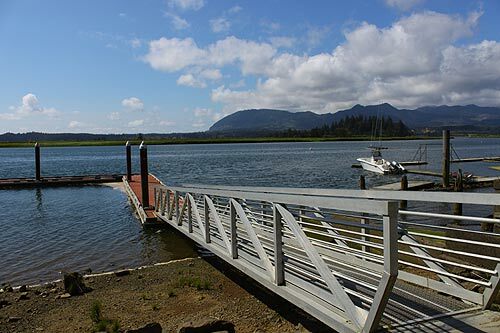 Nowhere on Earth, I firmly believe, is that old axiom about "Everything happens for a reason" more true than the Nehalem Bay area - specifically Wheeler. In fact, there is a legend among many of the locals about serendipitous coincidences that happen with startling regularity known as "Wheeler Moments," and an accompanying legend of the "good spirits of Wheeler." The premise is: when you and someone else are discussing a certain issue - particularly a wish of some sort - fairly frequently something will pop up to fulfill that. Or maybe something appears that augments or aids the direction in which you're heading - or something like that. Upon first hearing this concept in late 2003 from businessmen Garry Gitzen and Winston Lazlo, I balked at it with the usual cynicism of someone reared and weaned on the ethics and fact-gathering obsessiveness of an objective news journalist. But by this time, I'd already heard (and written about) the serendipity-filled story of how Winston and his wife Maranne wandered into the town on an extended vacation, and how something drew them here to stay and start a hotel business. The pair from Colorado had already discussed how cool it would be to start a B&B someday. Three months after visiting this charmer of a town, they wound up owning the building that eventually became the Old Wheeler Hotel. This was interesting coincidence Number One. Over the next year, they experienced a series of disasters which hindered them from refurbishing the old, dilapidated building - causing them to ponder if the building was somehow fighting them. The last six months abruptly started to go smoothly, even famously, as if the "Wheeler Spirits" had decided to accept them and help them along. That was Number Two. Then, I realized the strange truth behind my own exeriences in this area. There were already quite a few. There was the music of Russian rock star Boris Grabenchikov that I was introduced to here. I later interviewed him for The Oregonian and got to meet him at a party which itself added much to my life in other ways as well. Another "Wheeler Moment" happened for me and someone else when I was first introduced to the Nehalem Bay Winery back in May of 2000. That night, I suggested to owner Ray Shackelford that he should host a reggae show there. I'll never forget that he appeared to look at me blankly, like "what the hell are you talking about, kid?" 20 minutes later, someone said, "Ray's looking for you. He wants to talk to you about that Reggae idea." From there, the winery's fabulous annual Juneteenth Reggae Festival was born. Then, there was the time this past summer that I sat chatting with Maggie's Guestroom owner Peg Miller, complaining about my romantic situation. Suddenly, as if on cue, local artist Willow Bill shows up and hands me a willow stick, with parts of it bent into two hearts. Lovely - and serendipitous. A few days later, I become hooked up with a wild beauty from Portland. That situation didn't last long, but still, I credit Bill and my talk with Peg for bringing this fun little whirlwind romance into my life. Of course, I haven't forgotten to thank the "Good Spirits of Wheeler." There have even been "Wheeler Moments" in Portland. Like the freaky coincidence-filled time I wandered into a bar called Mint and discovered a room FULL of pals from the Nehalem Bay area, and how it turned out many of us there were connected in eerie ways we knew nothing about before this night. Peg has said of the Wheeler area it's a "spiritual vortex - lite." In the end, I learned that, yes Charlie Brown, there are Good Spirits of Wheeler. Or at least it's fun to think about. I must admit I have had an extraordinarily larger amount of good luck in the Nehalem Bay area more than anywhere else in the state. Maybe it's legend. Maybe it's just spin the locals put on the place for tourists. I don't care. I won't guarantee results: but I will suggest to people to go ahead and hang out here and make a wish. You never know.